OFFBEAT MAIL: Birth control methods for birds? Birth control methods for birds? Time and again, several commercial airplane crashes had been reported. They were not only caused by human errors but by the inevitable forces of nature. But one this is seriously alarming is the presence of high flying birds which was reportedly blamed for most of the accidents that resulted in the deaths of many people. Despite these negative developments, the federal government can only do so much by enforcing air transportation laws that are effective and practical. In fact, appropriate solutions to these problems had been made. But accidents are accidents and there's nothing we can do about them. Perhaps, the only best solution is to ensure that commercial planes are properly inspected and checked before flight. But accidents do happen in the most unexpected moments. Reports had it that some of the plane crashes were caused by birds which are sucked by the planes' engines in mid-air thus resulting in the failure of the plane's engine to conk out. I knew it sounds silly to the ears. But this is what concerned sectors claimed as a means to stop the growth of bird population in and around most airports across the United States, which give so much worries to airline officials and passengers alike these days. thousand airplane crashes due to birds. Los Angeles International airport was reported to have at least 583 airline accidents which was traced to birds sucked into the airplanes' engines. The problem that now lingers in most minds is how to implement birth control methods among the bird population, particularly the influx of Canadian wild geese across many parts of the United States. The plan may be good for the airline industry in general. But the at this stage, many people are already wondering how it willl be done with success, taking into consideration the mobility of the birds. It is common knowledge that millions of birds get in and out of most airports on a daily basis without letup. Without caring for what the animal rights groups are fighting for, shooting the birds that come to a busy airport seems an animal welfare violation. Perhaps, what the FAA should do instead is to field dogs to drive away birds that forage within the airport premises. If not, the getridofthings.com has suggested the following remedies to solve bird population explosion at airports. These include the setting up of silhouettes of birds of prey around the airport premises to scare other birds; the use of electronic bird alarm, especially those with audible sounds; and a non-toxic product like Flight Control, which can be applied to both turf and buildings. It is effective in repelling nuisance birds. 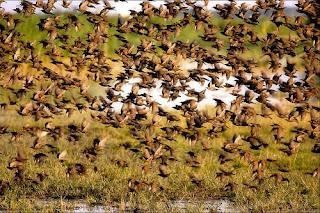 However, the simple notion of controlling the bird population by feeding them with seeds laced with a substance that would control the birds' reproductive process is a welcome proposition. Otherwise, it would be extremely difficult for someone to identify as to which birds needs the proper birth control procedure, especially at this time when even dogs could hardly get the same procedure for free due to costly expenses that will be entailed in the process.